A look at the new James Bond novel by Anthony Horowitz. There was always a good chance Anthony Horowitz would be invited back for another stab at 007. Trigger Mortis was well received by critics and many fans considered it to be the best continuation novel in the series. Little surprise really, as Horowitz is an unashamed fan of both Ian Fleming’s books and the film series. His Alex Rider series for young adults, featuring a teenager working for MI6, is clearly influenced by 007. In interviews to promote Trigger Mortis the author said he would be happy to write a second Bond novel if Ian Fleming Publications invited him to do so. A little more than a year later it was revealed that they had done precisely that. Just like Trigger Mortis, the new book was to have “inspiration again from original Fleming material”. 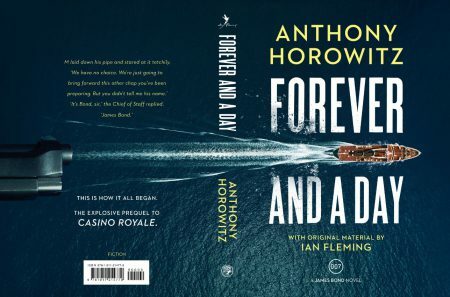 And then earlier this year we learnt that the title of Horowitz’s second Bond was to be Forever and a Day; that it would be set before the events of Casino Royale; and that it was about how James Bond became, well, James Bond. I wasn’t overly thrilled by the prospect of a Bond origins story as it now feels a little overdone. Although Forever and a Day is set prior to Ian Fleming’s books, both the Daniel Craig films and Jeffery Deaver’s Carte Blanche (2011) rebooted the character to explore similar territory. So when I began reading a review copy provided by the publisher, it was with some trepidation. The new book begins with a crisis in the Double-O Section, quickly dealt with by M. Chapter 2 then jumps back in time a little – a typical Fleming trick – as we learn how Bond gained his Double-O stripes before ending with what seems like a nod to the pre-titles of the films. It’s not until chapter 5 that the book really gets going, when we find James Bond on the waterfront in Nice. This is Bond as we know him – or almost – and the writing is as crisp and authoritative as Ian Fleming’s own. Such passages are a joy to read, both Flemingesque and completely new. It’s the same in a later chapter when Horowitz describes the road from Menton. The book flies along and, if anything, is a little too brisk at times. One thing I’d have liked is Fleming-style dining in all its delicious glory. Instead we get a meal that Bond doesn’t much enjoy. But Jean-Paul Scipio is a nasty piece of work, an obese Corsican heroin producer straight from the Fleming mould. He’s not the only villain though. Scipio has teamed up with American multi-millionaire Irwin Wolfe, a man holding a grudge against his own country – and the means to do something about it. It won’t be much of a surprise to learn that Bond survives the best efforts of Scipio to make it to the end of the book. But there are a number of hurdles along the way, one of which is particularly unpleasant. For me though – someone who knows Ian Fleming’s books far better than is reasonable – Horowitz shoehorns in too many of Bond’s preferences and habits, something common in many of the continuation novels. But casual readers just won’t care. There are a number of problems with the Bentley Continental mentioned early in the book too. Ian Fleming also messed up Bond’s cars, so maybe that is the point. But while Forever and a Day apparently takes place in 1950, Bentley only introduced the first Continental in late 1952. And why no mention of the 4½ litre supercharged Bentley he drives in Fleming’s early books, owned since 1933? But when Horowitz tells us Monte Carlo casino reminds Bond of a railway station, he gets Fleming spot on. In another real Fleming moment Bond explains to Madame Sixtine how he once saved the casino. It is reminiscent of the story Domino tells Bond in Thunderball, completely tangential to the plot but a great anecdote. It came as little surprise to learn that much that chapter, ‘Russian Roulette’, was based on an outline written by Fleming for an aborted television project. Anthony Horowitz has once again done a great job and both existing fans and anyone reading 007 for the first time will enjoy his new book. Forever and a Day is sure to be a hit so I’m certain Ian Fleming Publications will ask him to come back for a third time. It comes down to whether or not he wants to do another. Thanks for the review , I have a signed edition on it’s way to me from England as I type this email. Trigger Mortis was excellent and I am hopeful that this story will also be in the Bond way . Hopefully Anthony will be asked for a 3rd story .